What do the pet stores and kiosks recommend for your hermit crabs when you purchase them? Most likely hermit crab pellets, or maybe "cakes". While this food may be high in synthetically made vitamins and minerals, the chemicals used to preserve your food have found to be harmful to the molting cycle of land hermit crabs. Of course, this leaves us, the crabbers, which a decision to make: should we feed any of this food? Most crabbers opt to leave out the staple foods found in pet stores from their crab's diet. Besides, preparing a natural diet can be quite simple and the hermits can eat most of the things you can, but of course, with a few exceptions. 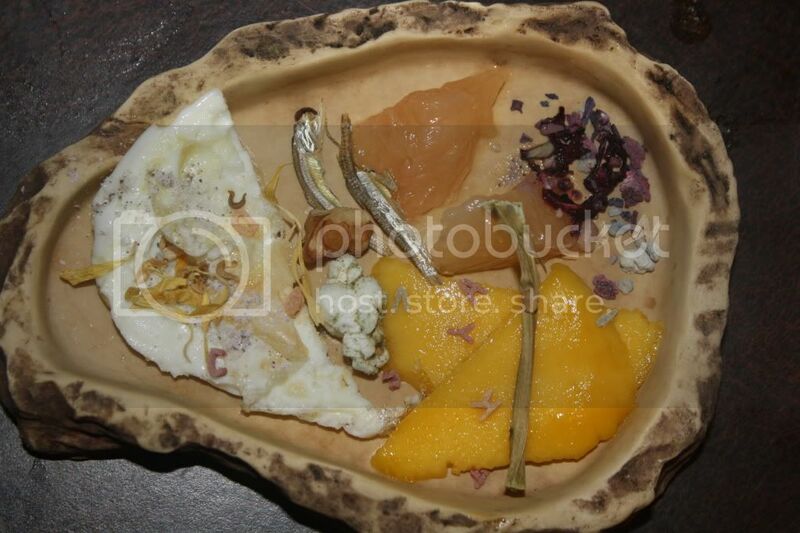 The above is EVOO fried egg, blue cornmeal, anchovies, hibiscus cuttlebone treat, dried asparagus, kelp-dusted popcorn, walnut, fresh grapefruit, fresh mango, organic alphabet pasta, and calendula petals. 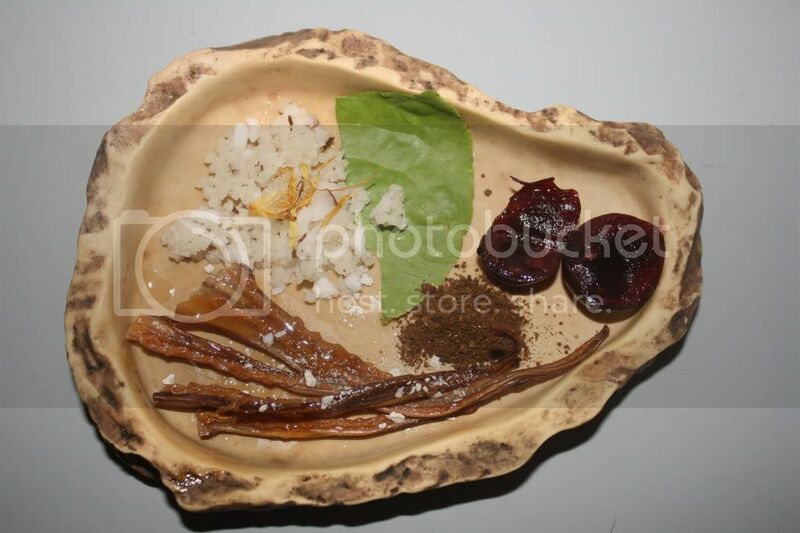 The above is saltwater rehydrated tentacles with honey glaze, coconut couscous with a calendula garnish, home-grown organic lettuce, fresh cherry, and my own Kilimanjaro's Kibble. A natural diet consists of all types of foods that are healthy for hermit crabs. 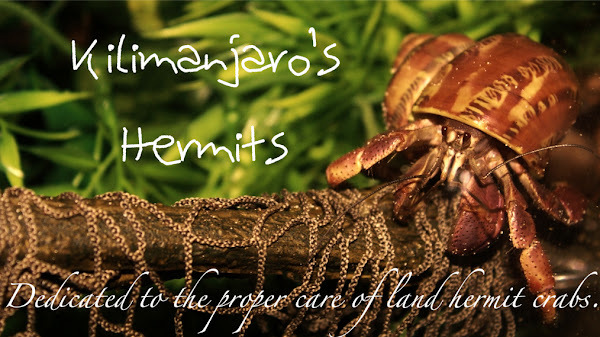 If you need more to understand the nutritional needs of the land hermit crab, look under "Kilimanjaro's Resources" for "Kilimanjaro's Guide to Land Hermit Crab Nutrition" on the left-side panel. There, one can find all the information needed to feed your hermit crabs naturally, without worrying you're not giving them enough nutrition. With a little practice, a natural diet can be easy to accomplish. And of course, it is necessary to mention that there are people out there who have the natural diet and busy crabber in mind. One can buy completely natural dry kibbles that you can easily feed to the crabs. Just keep in mind that fresh foods should be offered frequently, and dried foods are not an equal substitute for all the time! You can click on the shopping links on the left-side panel to find some of these great kibbles. Keep on crabbin'!